You DONOT need a PayPal account to make a purchase in our store. PayPal will process a credit card payment without requiring you to have an account with them. We will process your order within in 24-48hrs. Tax added & shipping options available at checkout. Click book image to enlarge and open in a new window or tab. New book started by Eleanor Preston prior to her death and completed by Nancy Porter, Tully Area Historical Society members. Printed on Demand. Spiral Bound. 69 Pgs. 2018. A compilation of veterans buried in Tully Cemetery, Tully, NY. Includes veteran photos and service records (as available) and headstone pictures. Information gathered from a variety of sources as listed on the source pages in back of book. Click image to view sample pages. Our most recent and updated alumni directory. 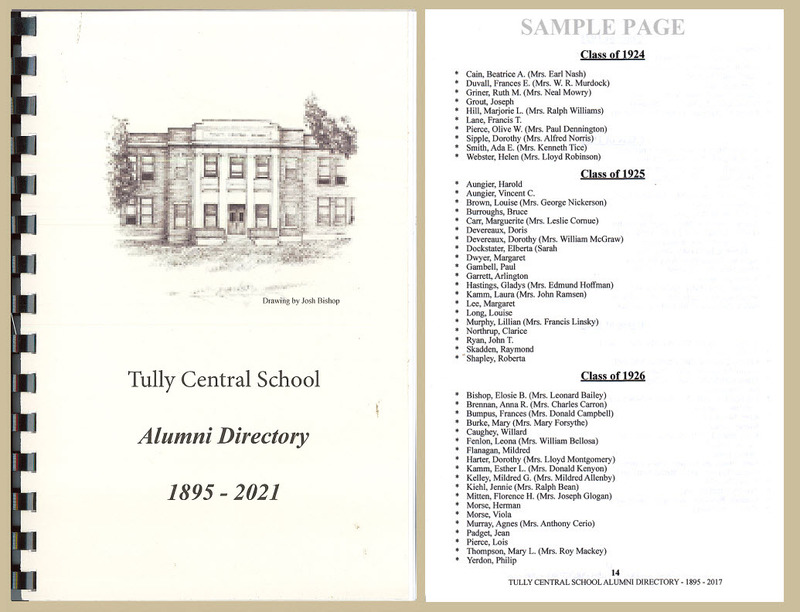 Lists alumni from the Class of 1895 through 2018. It is great for genealogists as it lists married names & the most recent address (that we know of) for each person. It is also great for looking up old buddies. 210+ Pgs. Printed on demand by TAHS. By Mary Dunn. 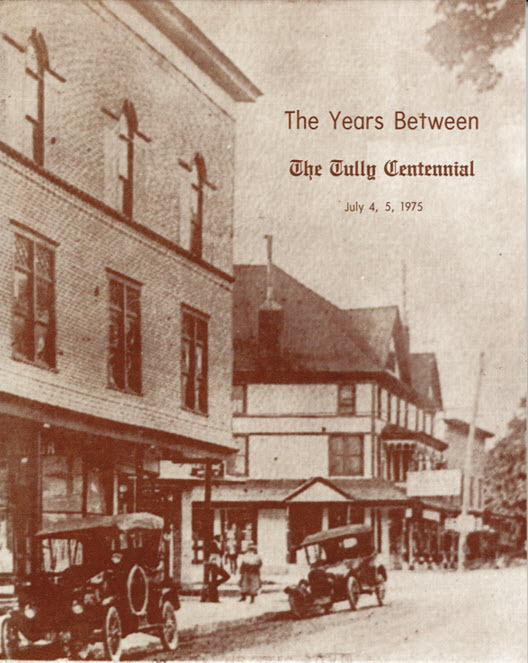 A Tully Bicentennial Publication, 1803-2003. 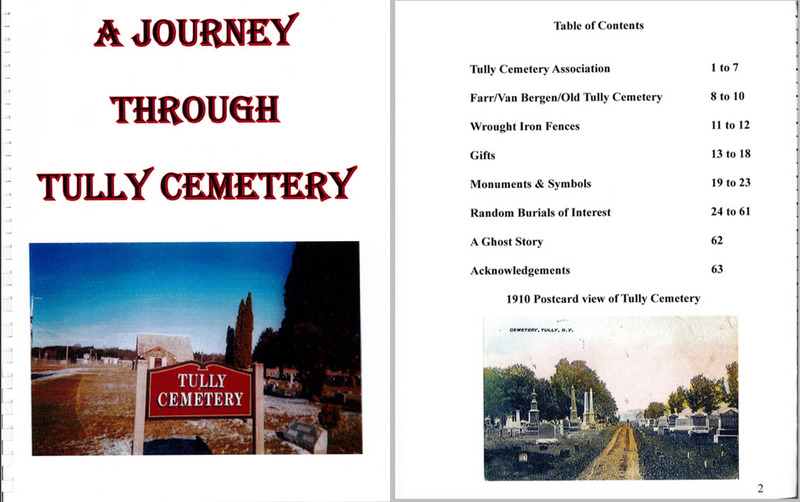 Published in 1999 by the Tully Area Historical Society. Paperback. 121 Pgs. 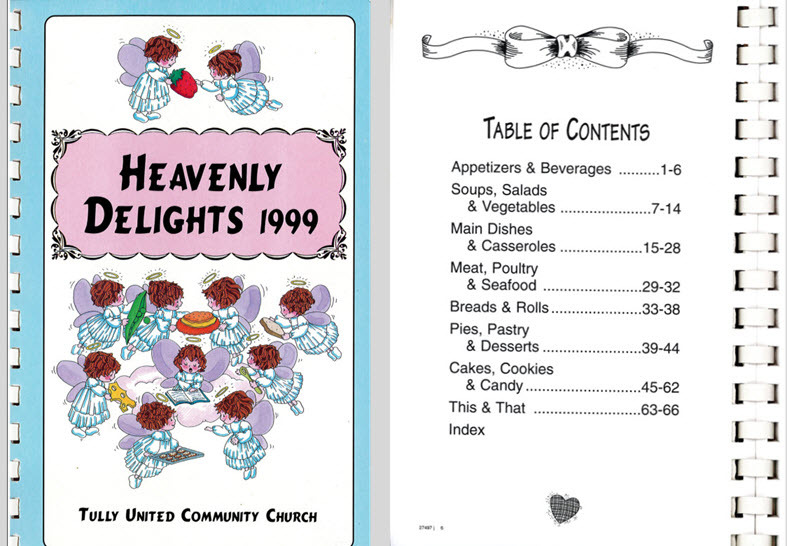 Published by the Tully United Community Church, 1999. Printed by Cookbooks by Morris Press, Kearney, NE. Paperback. 72 Pgs + Index. 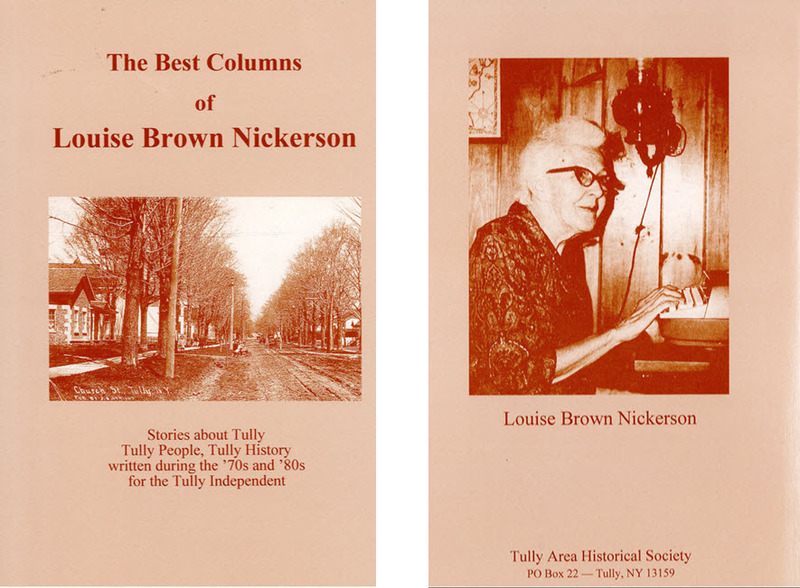 Stories about Tully, Tully People, and Tully History, written during the '70s and '80s for the Tully Independent. Published in 2003 by Heart of the Lakes Publishing, Interlaken, NY. Paperback. 110 Pgs. The Story of the Town Hall Mural. Paperback. 70 Pgs. By the Tully Cemetery Association. Compiled in 2012. Printed by the Tully Area Historical Society in May 2013. Paperback. 63 Pgs. By the Tully Centennial Committee. An overview of life then and now, peppered with ads from contributing local organizations and businesses. Filled with pictures from the past. Paperback. 81 Pgs. 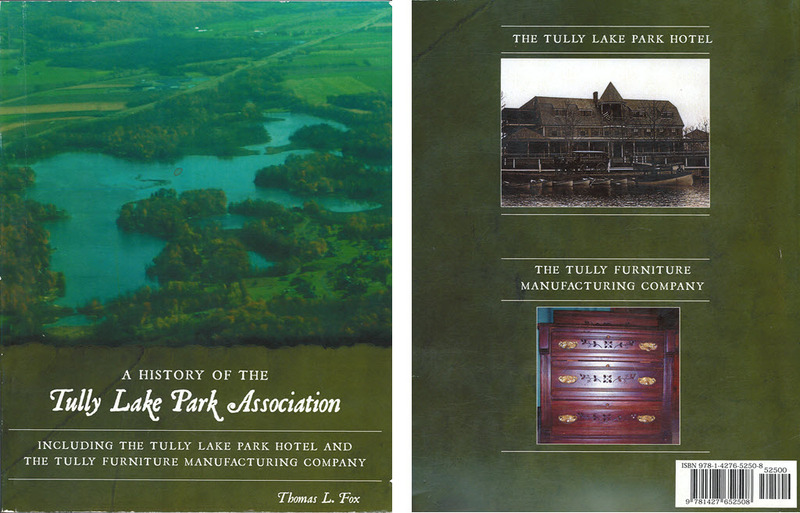 Including the Tully Lake Park Hotel and the Tully Furniture Manufacturing Company. By Thomas L. Fox. Paperback. Published Dec 2011. 155 Pgs. Donations have to be processed and paid for separately and will not be added to any cart generated from above items.